Around 7,000 years ago it was much, much warmer all around the globe. There's a lot of debate about the `Medieval Warm Period'. But I've always been intrigued by the warm period of 7,000 years ago, known as the Holocene Optimum, and I have been doing some digging to find out just how warm it was. I've come away rather amazed. Again and again you read remarks like this, from a study of stalagmites in South Africa: `Maximum Holocene cooling occurred at AD 1700'. By contrast the start of the interglacial was much warmer than today. How much warmer? 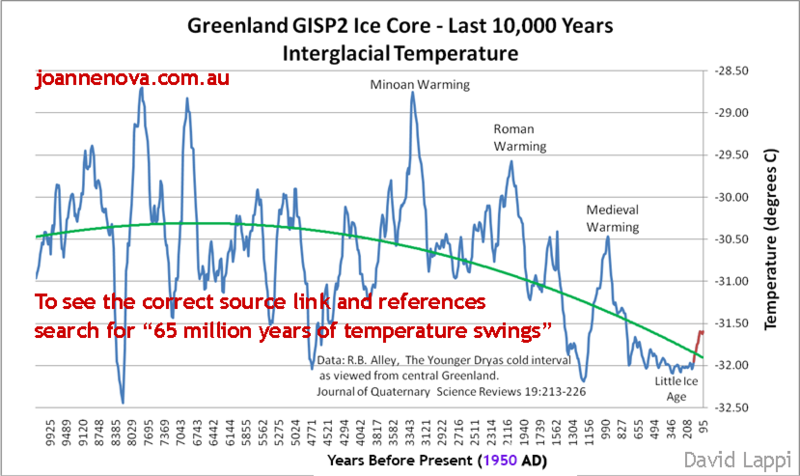 Between 8,000 years ago and 5,500 years ago the Greenland temperature apparently never got as low as today, and was sometimes -- 6,900 years ago and 7,700 years ago - even more than 3C warmer than today. Polar bears would have taken refuge on land for a few weeks or months - as they do in Hudson's bay today. But what about the rest of the planet? Throughout the northern hemisphere ice cores, lake sediments, marine sediments, pollen, tree lines and glacier histories all point to a culmination of the warmth around 7,000 years ago. By then, birch and larch trees grew much further north in all of Siberia than they do today, and one group of scientists reckons that Arctic Siberia experienced July temperatures a remarkable 2.5C-7C warmer than today. A study of sea sediment cores in the Chukchi Sea shelf in the Arctic Ocean concluded that `during the middle Holocene the August sea surface temperature fluctuated by 5°C and was 3-7°C warmer than it is today'. Yes, you read that right: up to SEVEN DEGREES CENTIGRADE. Ah, says the `climate consensus', but the Holocene Optimum was confined to the northern hemisphere during summer. Not so. Evidence from high latitudes in the southern hemisphere also shows warmth at the same time: Antarctic ice cores, Tasmanian and south African cave stalagmites . New Zealand glaciers, alkenones (algae derived fats) in seabed cores off Chile - they all point to a warm climate in the early Holocene before 7,000 years ago. Well all right, said the IPCC, but the tropical oceans were cool, even though the high latitudes were warm. Really? The only evidence comes from eight seabed cores taken from areas of ocean upwelling, which show slight warming rather than marked cooling since 7,000 years ago . But more cool upwelling generally indicates more warming elsewhere, so it is not clear what these eight cores are saying. The discovery of remains of alpaca moss (Distichia) from 5,000 years ago and 500 metres higher in the Peruvian Andes than it now grows, at a low latitude in the southern hemisphere (the plants had been covered by advancing glaciers some time after 5,000 years ago) seems at least to throw the burden of proof back on those who would argue for the Holocene Optimum being a solely non-tropical phenomenon . And some of the speleothems in the first chart come from Costa Rica, southern China, Panama and Borneo. Tropical enough for you? The Sahara, too, hints at a warm planet 7,000 years ago. The Sahara is always very arid during ice ages when the cool oceans starve it of seasonal rain. Its green and moist periods come during the warmest parts of interglacials. Its most recent really wet period lasted from 8,500 years ago to 5,300 years ago , coinciding with Greenland's least cold time. In this so called `African Humid Period', the Sahara was covered in forests, grasslands, and permanent hippo-filled lakes, and people drew rock art of crocodiles . The drying of the damp Sahara, after 5,300 years ago, coincides with a marked cooling in Greenland. Remember 7,000 years ago is not the deep past. It is three millennia after the establishment of agriculture; settlements like Jericho were already 2,000 years old. Ask yourself this: if the heat of 7,000 years ago, so widespread around the globe and so pronounced in the far north, did not cause planetary catastrophe, why should the lesser warmth of this century?